C tuning is the most common ukulele tuning. 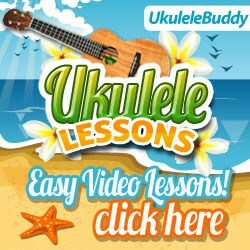 The ukulele can be tuned to a piano, a digital tuner or pitch pipe. It might be best to get a digital tuner. When using a pitch pipe or a piano, It can be difficult for a beginner to determine if the note they tuning to matches the note they are hearing. As a student becomes more experienced and develops their ear it will become easier to tune to a piano or pitch pipe. 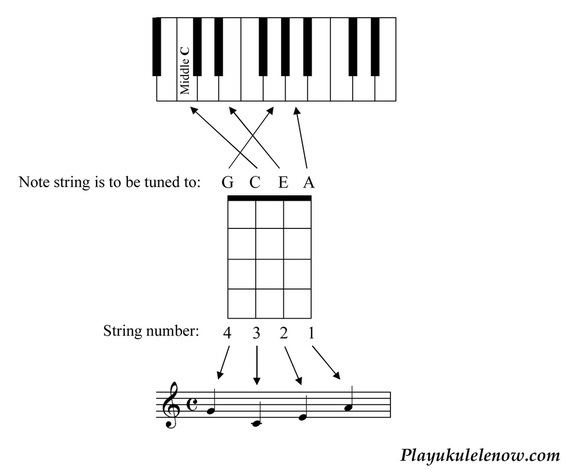 The Numbers indicate the four strings of the ukulele. The number 4 string is the closest to you when holding the ukulele. You blow into the pitch pipe and it produces a sound. You then tune the string on the ukulele to match that sound. It sounds a bit like a harmonica. The student must be able to tell when the note they are tuning on the ukulele matches the note they are playing on the pitch pipe. This may be difficult for beginners. 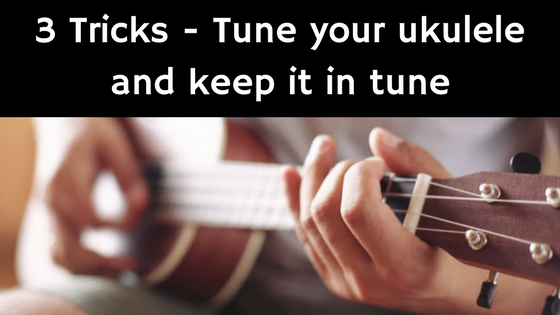 The best way to tune your ukulele is with a digital tuner. It will tell you which note you are closest to and how close you are to it. There's a meter on it that will tell you when you're in tune. 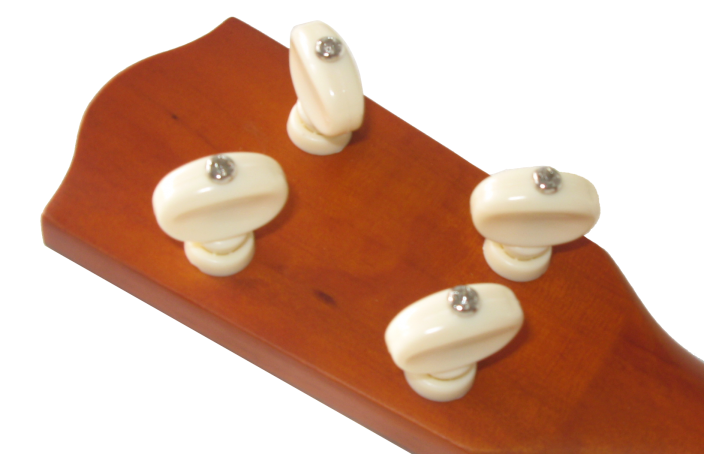 The tuner pictured above is one of my favorites because it clips right on to the ukulele and can be used with some background nose. Relative tuning means tuning the instrument to itself. This is useful if a tuner is not available. 1. Tune the first string to A if possible, (if you have something to tune it to). 2. Place your finger behind the 5th fret on the second string and tune it so that it sounds like the first string. 3. 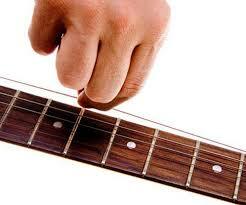 Place your finger behind the fourth fret on the third string and tune it so that it sounds like the second string. 4. Place you finger behind the second fret on the fourth string and tune it so that it sounds line the first string. Before you tune, especially if the ukulele or the strings are new, stretch the strings. 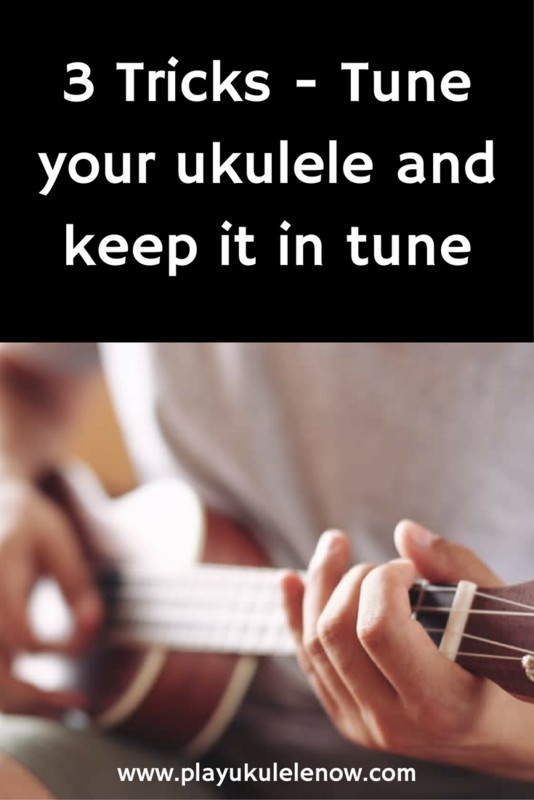 Do this by firmly pulling the string away from the ukulele one at a time. 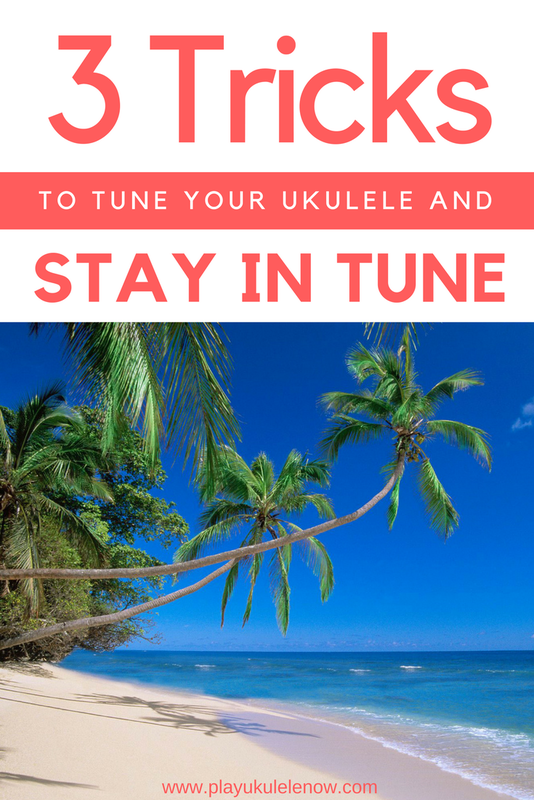 Even if you stretch the strings it could take a few days to a week for the uke to get dialed in and hold a solid tune because new strings will still stretch out a bit more as you are playing. Make sure the tuners are properly adjusted. 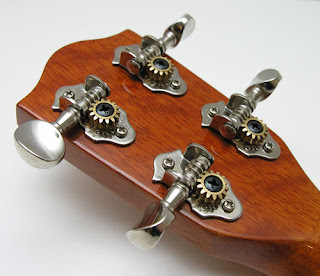 There is usually a screw in the tuning key that can be adjusted. Make sure the screw is tight enough that when the string is tuned up to pitch it holds the string securely. 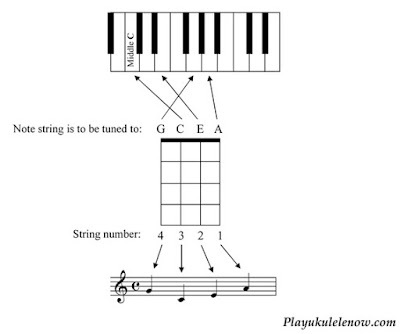 If not properly tightened the key can move and the string can slip out of tune. 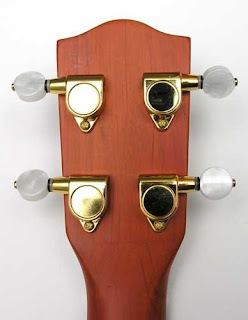 Even the least expensive tuning keys, if properly adjusted should work fine. Basic geared tuners like this are found on most entry level ukuleles. The screw on the gear must be tightened to prevent the gear from moving. If it is not properly tightened the tension of the string can cause the gear to move. 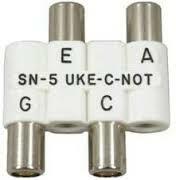 Most better quality ukuleles will have these. The screw on the bottom of the button must be tightened to prevent the string from slipping. When tightening the string you may notice these moving slightly with the pressure of the string, that just means they need to be tightened. These are similar to the geared tuner but the gear is sealed inside to prevent dust and dirt from interfering with it's operation. There is a screw that can be adjusted on the end of the tuning button if they slip. These are the least likely to need adjustment. Always tune up to the desired note, this helps keep the proper tension on the portion of the string that is wrapped around the tuning key. If the note is high go below the note and tune up to it very slowly. If you pass the note DO NOT GO BACK AND FORTH to get to the note. Go down below the note and tune up to it again. Tune up to the note slowly so you do not pass the note. These tips and tricks should help you keep most ukuleles in tune!